STOUGHTON, Mass. – Although Stoughton entered the playoffs on a roll, having won 11-of-12 games since a 1-7 start to the season, the Black Knights are a young and relatively inexperienced crew and there is a different feel to postseason play. In front of a packed house and a vocal home support, Stoughton came out of the gates a little rushed and struggled to pull away from ninth seed Dighton-Rehoboth, leading by just five at the break. After halftime, the Black Knights looked like the team that rolled through the end of the season. Stoughton held D-R to just six points in the third quarter and used a 16-0 run to break the game wide open and push the lead to as many as 22 points in a 52-35 win that advances the Black Knights to the Div. 2 South quarterfinal. The Black Knights got off to an inconsistent start, jumping out to a 7-2 behind a pair of jumpers from Lindsay McDonald (eight points and six rebounds), but struggling to take care of the ball and allowing D-R to tie the game despite only making one shot from the floor in the first quarter. Sophomore Mariah Harris came off the bench and scored in transition from an Aliyah Wright assist and then again scored on the break, this time following a Val Whalen steal and long outlet pass. The Falcons got off to a quick start to the second quarter with an 8-2 run giving the visitors a 15-13 lead. Freshman Sydnee Hyacinthe tied the game off a steal and pull-up jumper and Wright (10 points, eight rebounds, four steals, and four assists) gave the Black Knights back the lead with a transition basket. Hyacinthe drilled a three and then Harris got back-to-back steals and layups for four points in less than 10 seconds and a seven-point edge. At halftime, the Black Knights settled down and it showed with a dominant third quarter. “We went down to the locker and I just told everyone, we’re doing okay right now but we can do better definitely and we just need to slow down on offense,” Whalen said about the message to her teammates during the break. The message was well-received. McDonald knocked down a jumper and senior Jordan Motley, who sat much of the first half with foul trouble, scored to push the lead to double digits. 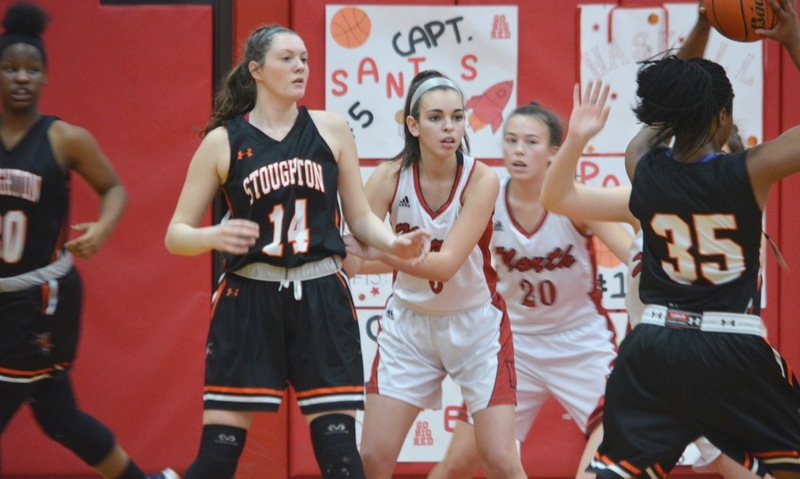 A three-point play and a three-pointer from the visitors, sandwiched around a pair of Whalen (eight points and 15 rebounds) free throws, cut the lead back down to six, but then Stoughton broke the game wide open. Motley scored with a spinning layup off a Hyacinthe assist and then the freshman guard knocked down her second three of the game. McDonald capped the quarter with another jumper for a 13-point advantage. The run continued in the fourth, as Wright scored plus a foul and followed it with an offensive rebound and put-back. Whalen added a three-point play and Hyacinthe pushed the lead to 22 points, 47-25, with a steal and layup and effectively put the game out of reach with half of the fourth quarter remaining. Stoughton (13-8) will now likely face a third meeting with Davenport division champion and top seed Foxboro, which won both meetings by double digits in the regular season. While the Warriors will be the favorites in the quarterfinal, Whalen for one is looking forward to getting a third crack and the league champion. STOUGHTON, Mass. – Even with a raucous crowd roaring just to her left, sophomore Lilah Milton knocked down the first of two free throws with fewer than 20 seconds remaining in the game to give Canton a one-point lead at Stoughton and put the Bulldogs on the brink of tournament qualification for the first time since 2011. Milton’s second free throw bounced off the front of the rim and was rebounded by Stoughton junior Lindsay McDonald, as the home crowd somehow got even louder, adding to the playoff-like atmosphere of the rivalry game. Maggie Connolly came within inches of a steal for the Bulldogs at midcourt, but Aliyah Wright came away with it and found McDonald open in the corner. With adrenaline pumping, McDonald’s shot sailed over the rim, over 6-foot-3 Canton center Erin Devine and right to the hands of Jordan Motley. The forward went up strong, finished around the outstretched arms of Devine with four seconds on the clock, and lifted Stoughton to a thrilling 49-48 come from behind victory. A night that began with Motley being honored on the court with the rest of Stoughton’s senior class ended with her being swallowed up by her classmates who stormed the court after the final horn sounded. It was a heartbreaking finish for Canton, but the Bulldogs season is far from over. Canton will travel to Weymouth on Tuesday and a win will clinch the program’s elusive return to the playoffs. Stoughton got off to a great start, leading 6-0 in the early going, but Canton bounced right back behind junior point guard Julia Hamilton, who caught fire from three-point range. Hamilton hit four from beyond the arc, scoring 12 of her team-high 14 points in the quarter. With Devine on the bench with foul trouble, Milton stepped in with four points to help the Bulldogs to a 16-10 lead after one. The Black Knights came back strong in the second by getting the ball into senior forward Val Whalen (19 points and 14 rebounds). She scored nine points in the quarter and was helped by Wright (15 points), who also scored nine in the second. After a Whalen put-back, Connolly went end-to-end for a layup but Stoughton went into the break leading 31-28. Canton came out strong in the second half, holding Stoughton to two points on a couple of free throws in the third quarter and putting together what ended up being a 17-4 run that put the Bulldogs ahead by as many as 10 points (45-35). After being held to just five points in the first half, senior forward Hannah Jerrier (13 points and 14 rebounds) scored six in the third, including a layup off a Connolly offensive rebound and assist. In the fourth, Canton continued to be aggressive on the offensive end with Milton (12 points) competing a three-point play and Hamilton driving and dishing to a cutting Connolly (six points and 10 rebounds) for a layup that extended the lead to 10 points and forced a Stoughton timeout. The Black Knights regrouped, switched to man-to-man defense and were spurred on by one of the largest crowds the team has drawn this season. Wright scored off a Sydnee Hyacinthe assist in transition to start the comeback and Motley scored in the post to cut the lead down to five. A Whalen transition basket made it a three-point game and this time it was Canton forced to call time. Wright swooped across the rim for a lefty layup on the break to make it a one-point game at 45-44, but Hamilton answered with a pair of clutch free throws for the Bulldogs. Whalen assisted on a Wright basket to again make it a one-point game and then the senior made 1-of-2 at the line to tie it. Had the Black Knights not gotten the win, free throw shooting would have been the story for the hosts, who made only 14-of-32 at the line. Instead, the win gives Stoughton, which has now won 10-of-11 since a 1-7 start to the season, even more confidence heading into the tournament, especially if the Black Knights continue to get this level of support from the fans. Stoughton (11-8, 10-6) will close out the regular season on Monday when Norwood pays a visit. Canton (9-10, 7-9) will travel to Weymouth on Tuesday night. Foxboro, 62 @ Attleboro, 58 – Final – Click here for a recap of this game. Canton, 62 @ Oliver Ames, 50 – Final – Canton turned a five-point lead after one quarter (14-9) into a 34-17 lead at halftime. The Bulldogs kept that lead through three quarters before OA made a late charge, cutting the deficit to single digits (54-45) with 1:36 to play. Canton closed the door though, picking up its 12th win. Canton junior Devin Foster poured in a game-high 27 points while seniors Jake Verille and Tony Harris each had 10 points for the Bulldogs. OA senior Jack Spillane finished with a game-high 22 points while Jake Erlich added 10 points. Sharon, 48 @ Franklin, 78 – Final – Franklin scored 39 points in each half, building a double-digit lead by halftime and never looking back. Franklin sophomore Chris Edgehill scored a game-high 25 points to lead the Panthers while senior Paul Mahon added 14 points. Malik Lorquet had 13 points to lead the Eagles while Aaron Strong added 10 points. North Attleboro @ King Philip – Postponed to Wednesday, 1/31 at 6:30. Milford, 41 @ Mansfield, 72 – Final – After a close first quarter, Mansfield outscored the visiting Hawks 17-5 in the second quarter to take a 37-19 lead into the halftime break. Milford outscored Mansfield 17-13 in the third quarter but the Hornets dominated the fourth quarter (23-5) to earn the win. Mansfield hit 13 three-pointers, including five by senior Tyler Boulter (19 points), three from Tommy Dooling (nine points) and two from John McCoy (19 points). Sam Hyland added nine rebounds and six assists for the Hornets. Brendan White had a team-high 10 points for the Hawks. Stoughton, 74 @ Taunton, 85 – Final – Taunton poured in 31 points in the third quarter, turning a two-point lead at halftime (39-37) into a 70-49 lead heading into the final quarter. Despite Stoughton dropping 25 points in the final frame, the Tigers hung on for the win. The Tigers had a balanced scoring attack with senior Lens Esquil scoring a team-high 18 points, sophomores Dante Law and Naz Kenion each netting 14 points and senior Malik Charles finishing with 12 points. Stoughton senior Colin Sanda scored a career-high 20 points for the Black Knights. Attleboro, 37 @ Foxboro, 67 – Final – Ashley Sampson scored 18 points and Lily Sykes added 15 as the Warriors rolled to another big win and stayed unbeaten in the league this season. Abby Hassman chipped in with a big game on the glass for Foxboro, pulling down 18 rebounds. 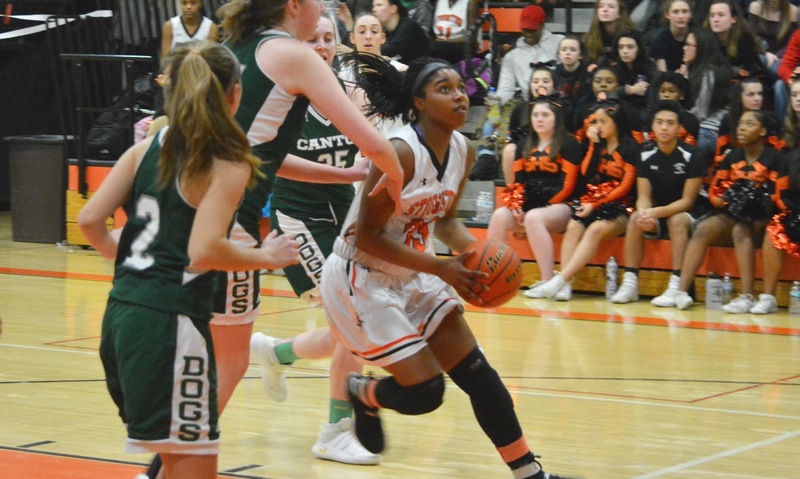 Oliver Ames, 62 @ Canton, 42 – Final – Oliver Ames pulled away in the second half to beat Canton on the road. The Tigers led 31-25 at half. Kayla Raymond finished with a game-high 15 points and hauled in eight rebounds to lead the Tigers while Alex Sheldon added 11 points, including going 7-for-8 from the free throw line, and pulled down eight boards. King Philip @ North Attleboro – Postponed to Wednesday, 1/31 at 6:30. Mansfield, 53 @ Milford, 40 – Final – Click here for a Recap and Photo Gallery from this game. Taunton, 41 @ Stoughton, 60 – Final – The Black Knights made it five wins in a row thanks to a 16-0 run to start the second half. Val Whalen paced Stoughton with 16 points and 19 rebounds while junior Lindsay McDonald added a spark with eight points and 11 rebounds. Aliyah Wright added 13 and five assists and Jordan Motley chipped in with 10 points, as the Black Knights closed within a game of .500. Mansfield, 1 @ Norwood, 1 – Final – Jake Lund scored early in the second period to help the Hornets earn a point on the road against Norwood. Franklin, 2 @ Ursuline, 1 – Final – Regan Paterson scored a pair of goals to lead the Panthers to a road win. NORTH ATTLEBORO, Mass. – Coming into Friday night’s game at the Pickering Gym, Stoughton had lost four games by seven or less points, struggling to find ways down the stretch to pull out wins. When North Attleboro climbed back to within five points in the fourth quarter, it looked like that may happen again for the Black Knights. Instead of letting the game slip away, senior forward Val Whalen took over down the stretch. She scored 10 points, made 8-of-10 from the free throw line, and dominated the paint to help Stoughton close with a 17-6 run that sealed a 59-43 victory over North and ended the Black Knights’ winless start in the league. Whalen finished the game with 19 points and 19 rebounds, while also adding four assists and two blocks. North struggled to find an answer for the senior on either end of the floor. Stoughton took over on the boards right from the opening tap. Whalen pulled down nine rebounds in the first quarter and scored seven points, with both of her baskets coming on putbacks at the rim. Sophomore guard Aliyah Wright (13 points, nine rebounds) also chipped in with six in the first. North tried to stay close with its perimeter game. Julia Feid (team-high 12 points) and Emily Haskell (eight points) each knocked down threes to keep North within seven (17-10) after one quarter. The Rocketeers made only one shot from the floor in the second, but were managing to stay close thanks to 9-of-12 shooting from the free throw line. 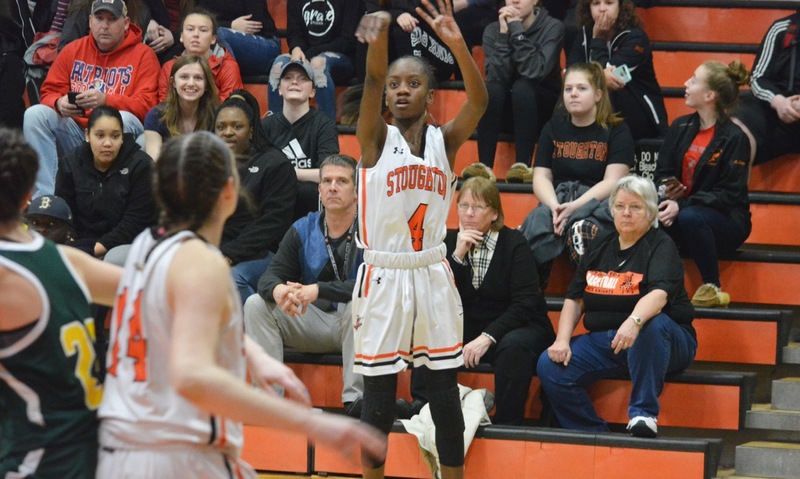 Stoughton’s aggressive defense was giving North free points, but sophomores Shyanne Trinh (14 points) and Mariah Harris (seven points) each hit threes to keep the Black Knights ahead. With North hanging around, down just eight inside the final few seconds of the half, Trinh took off on a coast-to-coast run that ended with a layup and a 30-20 halftime lead, which left North’s bench frustrated. 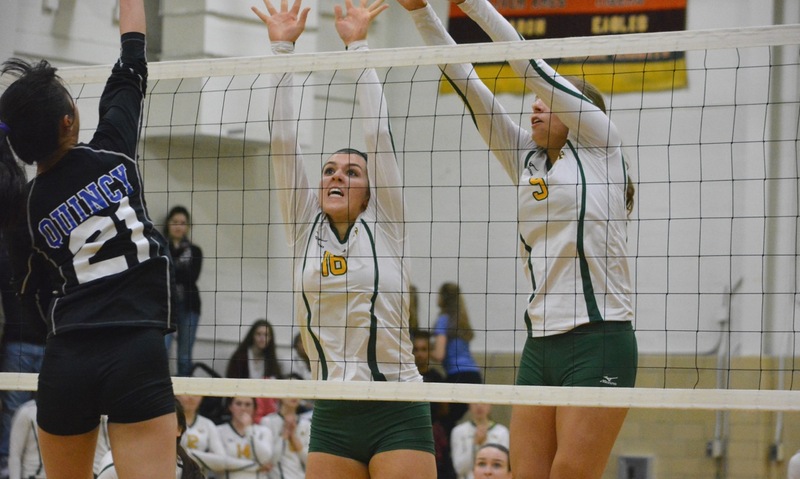 “We did okay with our game plan, but they’re a good team, they’re battle-tested, and they’ve got some kids who’ve been on varsity for two or three years now,” said Herber. Fouls continued to rack up for Stoughton in the second half. North shot 12 free throws in the third and reached the bonus before the end of the quarter. Feid scored on an offensive rebound to cut the lead back to 10 and Julia Santos (eight points, 11 rebounds) added a putback as well. Heading to the fourth quarter, Stoughton’s lead, which had been as many as 13 was down to just seven. North continued to battle early in the fourth. Sophomore Eliza Dion (seven points) drove through the Stoughton defense for a layup that made it 40-35 and, after a pair of Whalen free throws, Haskell drove on the other side for a bucket that again got the Rocketeers within five points. It was as close as North would get. Wright scored on a runner in the lane and found Whalen leaking out in transition for an easy basket to push the lead back to nine. 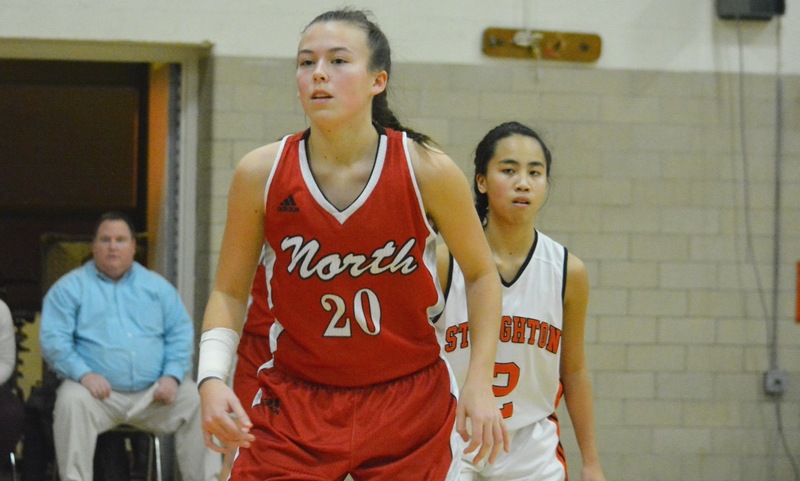 Whalen grabbed an offensive rebound and kicked it out to Trinh for an open three that put Stoughton up by double digits and then Whalen sealed the win with six free throws in the closing minutes. Stoughton (2-7, 1-5) will travel to Sharon on Tuesday night trying to make it two in a row in the Hock. North Attleboro (1-7, 0-6) will try to get its first win in the league on Tuesday at Milford. Stoughton, 57 @ Attleboro, 72 – Final – Attleboro turned a one-point lead after one (17-16) into a 12-point gap by halftime (38-26) and never looked back against the visiting Black Knights. The Bombardiers shot 11-for-19 from three-point range (58%) with junior Mason Houle hitting five, netting a career-high 19 points. Sophomore Qualeem Charles also had a career night, netting a personal best 21 point while hauling in 18 rebounds. Junior Dom Victor added 10 points for Attleboro, who led 52-43 after three quarters. Stoughton senior Cam Andrews notched a team-high 17 points while Colin Sanda produced 13 points for the visitors. Canton, 59 @ Mansfield, 67 – Final – Canton took a one-point lead after the first quarter, and a three-point lead into the fourth but Mansfield outscored the visitors 23-12 in the final frame to pull out the win. Mansfield opened the fourth quarter on a 13-4 run to create the separation. Senior John McCoy (10 rebounds) led the way for the Hornets with a career-high 22 points while Damani Scott dropped a career-high 13 points along with 12 rebounds. Canton’s Tony Harris scored a career-high 23 points with 11 rebounds while junior Devin Foster added 13 points. Foxboro, 57 @ King Philip, 48 – Final – Foxboro senior Joe Morrison played the role of run stopper, draining a key three-pointer with just over a minute to play to help the Warriors survive a comeback attempt from King Philip. Foxboro built a 46-29 lead with just over a minute to play in the third quarter before KP put together a comeback over the next eight minutes. KP outscored Foxboro 16-5 during the stretch, closing the gap to just five (50-45) before Morrison buried the big shot. Morrison finished with a game-high 20 points, sophomore Brandon Borde added a career-high 15 points and Bobby Harrison added a career-best 10 points for Foxboro. King Philip senior Pharoah Davis led the hosts with 16 points, Brendan King added 11 points and junior Kyle Layman chipped in with 10 points. Milford, 36 @ Franklin, 55 – Final – Franklin sophomore Chris Edgehill exploded for a career-high 28 points, helping the Panthers race past Milford. Franklin built a double-digit lead in the first quarter and kept a comfortable cushion the rest of the way, leading 34-21 at the break. Junior Jalen Samuels added 10 points and eight rebounds in the win for Franklin. Andrew Fraioli led Milford with eight points. North Attleboro, 51 @ Taunton, 72 – Final – Taunton’s offense scored 20 or more points in two quarters and had 11 different players find the scoresheet in a win over North Attleboro, who was playing its season opener. The Tigers raced out to a 22-10 lead after the first quarter with sophomore Dante Law scoring seven of his team-high 18 points and junior Lou Vendrell netting six of his eight points in the frame. North junior Josh Montague scored 18 of his career-high 25 points between the second and third quarters. Taunton junior John Martins added 10 points while senior Lens Esquil added nine and sophomore Prince Brown chipped in with eight points. Sharon, 49 @ Oliver Ames, 57 – Final – Click here for a recap of this game. Attleboro, 46 @ Stoughton, 43 – Final – The Bombardiers rallied from eight points down in the final quarter by outscoring the Black Knights 19-8 in the fourth to earn Marty Crowley’s first win at Attleboro. Abby Struminski hit a go-ahead three to put Attleboro in front and Jordyn Lako and Sam Pierce hit free throws to seal the victory. Pierce was Attleboro’s top scorer with 16 and Nyah Thomas added 11. Aliyah Wright led Stoughton with 15 points while Jordan Motley had eight points and 17 rebounds. Mansfield, 67 @ Canton, 35 – Final – Mansfield bounced back from a loss to Foxboro with a road win at Canton. Mady Bendanillo and Meg Hill were the top scorers for the Hornets, each with 13 points. King Philip, 21 @ Foxboro, 65 – Final Lily Sykes scored 21 points and Ashley Sampson had 14 to lead Foxboro to a second straight victory in the league. Abby Hassman also chipped in with 14 rebounds in the win. Franklin, 58 @ Milford, 47 – Final – Three players scored in double digits, as Franklin improved to 3-0 on the season. Bea Bondhus scored 19 points, Megan O’Connell scored 17 and Ali Brigham had 10 points for the Panthers. Gillian Valanzola was Milford’s top scorer with 13 points. Taunton, 50 @ North Attleboro, 29 – Final – The Tigers made it three wins from three games with a road win at North. Mackenzie Handrahan led Taunton with 17 points and nine rebounds and Lily Patneaude added 11 points in the victory. Julia Santos was the top scorer for North with nine points. Oliver Ames, 54 @ Sharon, 27 – Final – Oliver Ames’ defense limited the Eagles to just 12 points at halftime, building a double-digit lead and never looking back. OA senior Kayla Raymond recorded a game-high 13 points while junior Alex Sheldon added 12 points for the Tigers in the win. Ally Brown scored eight points to lead the Eagles. Canton, 0 @ Franklin, 2 – Final – Click here for a recap of this game. Stoughton, 1 vs. Nauset, 7 – Final – Stoughton junior Sean Doherty scored for the Black Knights while head coach Dan Mark said Thomas McCoy played well in net.